In terms of geography, the global pharmacy repackaging systems market is segmented into North America, Europe, Asia Pacific, Latin America, and the Middle East and Africa. The health care infrastructure in the developed regions such as North America and Europe are well-established and has been focusing on developing their medication workflow by shifting toward pharmacy automation systems including repackaging systems. Moreover, promising reimbursement programs in the region is anticipated to increase demand for these technologies during the forecast period, especially in North America. Countries in North America are rapidly advancing the frontiers of technological development as well as setting stringent standards for medication management. This, in turn, is likely to propel demand for repackaging systems in the regional market, which caters to the basic requirement of customized dosage in various end-user domains. This report on the global pharmacy repackaging systems market analyzes the current and future prospects of the market. The report comprises an elaborate executive summary, including a market snapshot that provides overall information of various segments and sub-segments. The research is a combination of primary and secondary research. Primary research formed the bulk of our research efforts along with information collected from telephonic interviews and interactions via e-mails. Secondary research involved study of company websites, annual reports, press releases, stock analysis presentations, and various international and national databases. The report provides market size in terms of US$ Mn for each segment for the period from 2014 to 2024, considering the macro and micro environmental factors. Growth rates for each segment within the global pharmacy repackaging systems market have been determined after a thorough analysis of past trends, demographics, future trends, technological developments, and regulatory requirements. Market revenue in terms of US$ Mn for the period between 2014 and 2024 along with the compound annual growth rate (CAGR %) from 2016 to 2024 are provided for all the segments, considering 2015 as the base year. The year on year growth of global pharmacy repackaging systems market for each segment is also reflected. Additionally, market related factors such as increasing preference for product innovation, and cost reduction for hospitals and greater affordability for patients in various geographies and historical year-on-year growth have been taken into consideration while estimating the market size. Based on product type, the global pharmacy repackaging systems market has been segmented into blister card/compliance packaging systems, pouch packaging automation systems, bottle filling/ pill counting automation systems, liquid medication packaging systems and others. Based on end-user, the market has been segmented into retail/community pharmacy, hospital pharmacy, long-term care (ltc) pharmacies and mail order pharmacies. Retail/community pharmacy segment is expected to remain dominant during the forecast period. 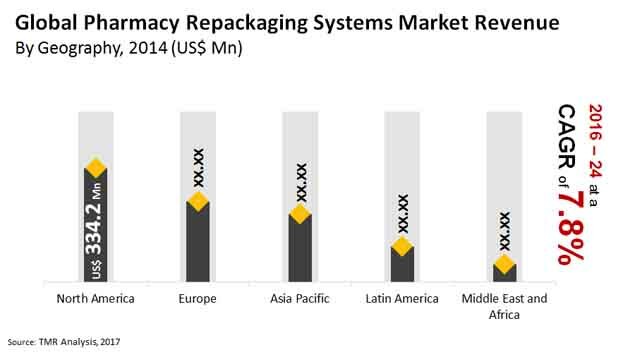 Geographically, the global pharmacy repackaging systems market has been segmented into five regions: North America, Europe, Asia Pacific, Latin America, and Middle East & Africa. In addition, the regions have been further segmented into major countries from each region. These include the U.S., Canada, the U.K., Germany, France, Italy, Spain, China, Australia, India, Japan, Brazil, and Mexico.